Bill for roses from Thomas Rivers, junior, of Sawbridgeworth, 1842. Was Emma Delmé-Radcliffe planning a rose garden at Hitchin Priory? She bought over 100 rose bushes from Rivers, a pioneering rose breeder. 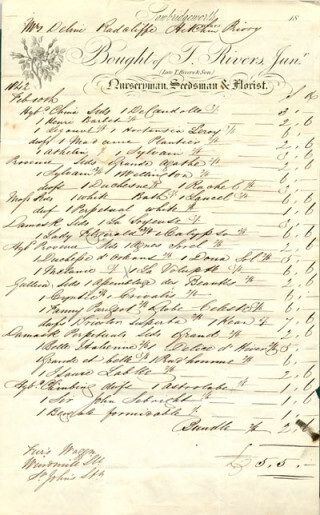 This bill includes a ‘Madame Laffay’ a new variety bred by a French nurseryman, in 1837.